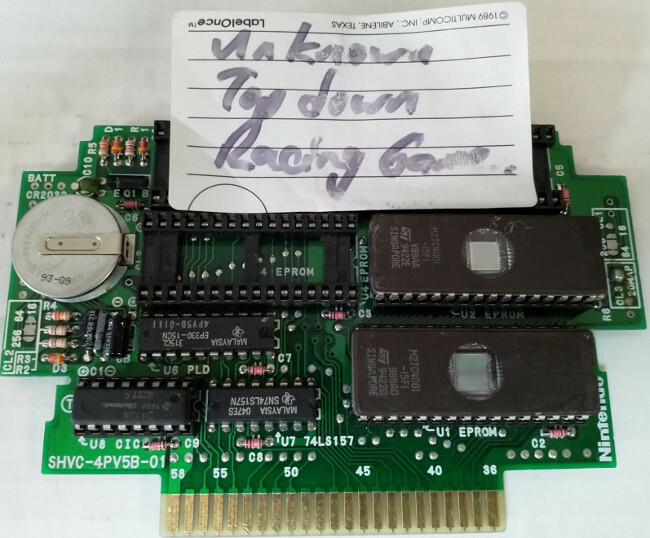 This is a prototype of an untitled overhead racing game by Virgin Games. There is not a whole lot to say about this game. 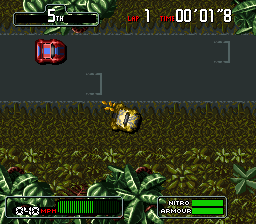 It appears to be a one track demo of a top-down racing game, presumably by Virgin Games. 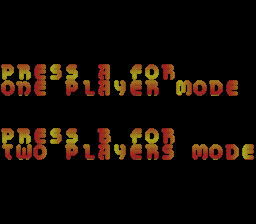 There is a two player split-screen mode already implemented. The controls are smooth, and the music and sound effects are solid. The graphics are ok, but the cars are really squished. As far as I can tell, no finished game ever came from this. There are some fragments of Super Bomberman in the ROM image, which was likely burned onto the EPROMs prior to this demo. The EPROMs have date stamps from mid-1994, so this game was likely made after that. 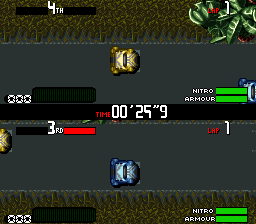 Note that this game does not work old versions of SNES9x, possibly due to it incorrectly detecting the mapping. It works fine in bsnes/higan and snes9x 1.58.